Option 1: Use the Optimize Branch Style feature to apply styles across the entire chart. Select the Home tab and click the Optimize Branch Style button. Auto allows OrgPlus to apply the branch styles that make the best fit on each page. Wide applies branch styles that emphasize a horizontal layout. Stagger organizes boxes in a one up/one down style. Compact applies branch styles that decrease the space between boxes and create the most white space around the chart. – Choose to apply the style to the entire chart or to the sub-chart that is currently displayed on the screen. – Select the Override sorting feature if you have applied sorting to the chart and you want to ignore this sorting in favor of the selected branch style. – In the example shown here, the stagger branch style has been applied. Option 2: Use the Chart Styles feature to further refine your chart layout. Select a specific branch by double-clicking any one box in the chart branch. – Select the Home tab and click the Chart Styles button. – Use Assistant styles to determine the layout of assistant boxes. 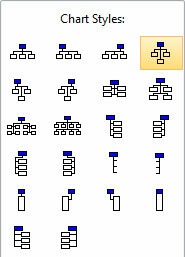 – Use Co-Manager styles if you have branches in which multiple managers oversee a group of employees. – Use Advanced styles for especially large branches or for unusual branch layouts. Ensure that you effectively communicate your organization’s hierarchy by choosing the best branch styles andlayout for your chart. Use the Optimize Chart Styles tool to quickly impact the entire chart or sub-chart and use the Chart Styles tool to customize the layout of specific branches.